Hyperlinks make a presentation non-linear by connecting it with other slides, documents and web pages. This guide demonstrates how to add hyperlinks to a PowerPoint presentation, so that they work both on a local computer and online. You’ll also learn other PowerPoint tricks, such as linking to a YouTube video, changing hyperlink color, configuring navigation and others. What PowerPoint objects can be assigned with a hyperlink? The options aren’t limited to texts and pictures; below you will find a list of all options available. Select the frame of a text box, and the whole area, including the white space around the text, will be clickable. The text will not be underlined or colored. Select the text only, and the rest of the text box will not be clickable. The text will be underlined and colored. You can add a hyperlink to any shape or group of shapes. To do that, select the frame of a shape. If you have placed text within a shape, it will not be underlined or colored. Select the the text within a shape, and the rest of the shape area will not be clickable. The text itself will be underlined and colored. You can assign a hyperlink to any SmartArt object or group of SmartArt objects. To do that, select the frame of a SmartArt object. Select the the text within a SmartArt object, and the rest of the SmartArt area will not be clickable. The text itself will be underlined and colored. Any picture you insert into your PowerPoint presentation can have a hyperlink. You can use images to illustrate textual ideas, or create custom buttons instead of using PowerPoint templates. Other PowerPoint objects such as video and graphs can’t be assigned with hyperlinks. If you use SmartArt objects or stylized text and plan to publish your presentation online, we recommend you read about advanced hyperlink techniques. Select the desired object on your slide. Go to the INSERT tab and click the Hyperlink button as demonstrated in the picture. In the open window, click Place in this Document under Link to. Choose the slide in your presentation that you wish to use as a destination, then click OK. If you have created a custom slideshow (a certain sequence of slides) and you want to connect your object with it, click Custom Shows. Then tick the Show and return checkbox. You may connect your presentation to a document on your computer, for example another presentation, or even a particular slide in it. However, if you then move your project to another PC, you’ll need to copy the connected document to the same folder. The link won’t work in cases where you don’t copy the presentation, or you rename, move or delete it. Also note that if you plan to publish your presentation online, you’ll need to convert all the connected presentations to online format and use the resulting web pages rather than the source .pptx files. You can learn how to do it here. Select an object on your slide, then go to the INSERT tab and click the Hyperlink button. Click Existing File or Web Page under Link to. Locate and select the document that you want to use as a destination, then click OK. If you wish to link a slide in another presentation, locate and select that presentation on your computer. Then click Bookmark, and in the open window choose the relevant slide. Select a relevant object on your slide, then go to the INSERT tab and click the Hyperlink button. In the address field, type in the address of the web page you wish to add, then click OK. If you want to add a hyperlink to a certain place on the webpage, you can either use the anchor in the website address OR the Bookmark option. You can follow the steps above to add a hyperlink to a video from a video hosting website, such as YouTube or Vimeo. However, there’s a way to insert an online video right in your presentation, so that it can be played back without having to interrupt the playback and open a browser. To learn how to do that, read these articles on How to insert a YouTube video into an online presentation and How to add a Vimeo video to a presentation. Note that this type of hyperlink can only be used in PowerPoint; it won’t work in a web browser when sharing a presentation online. To add a hyperlink to a new file, select an object on your slide. Go to the INSERT tab and click the Hyperlink button. Click Create New Document under Link to. By default, a new document is created in the same folder with the presentation’s source file. If you want to change the location, click Change under Full path, select the desired location, and then click OK. Enter the name of a new file in the Name of new document field, then click OK. Under When to edit, choose if you want to Edit the new document later or Edit the new document now. Just as with new files, hyperlinks to an email address don’t work in a web browser when sharing a presentation online. Click E-mail Address under Link to. Type in the appropriate e-mail address in the E-mail address box. Optionally, you may indicate the subject of your e-mail message in the Subject box. In fact, there’s a way to assign a hyperlink to a SmartArt object or stylized text for an online presentation, and even videos. To do that, you should create a transparent hyperlink area over an object. This solution may also be useful for designers of those touchscreen apps, which elements are often so small that it’s hard to tap them. Go to the INSERT tab on the PowerPoint ribbon and click Shapes. Select a rectangle or any other form that matches the relevant object. Draw the shape over the desired area (e.g., video). Right-click on the drawn shape and click Hyperlink. Add the desired destination and click OK.
Now right-click on the shape again, and choose No Fill under Fill and No Outline under Outline. Note that when a transparent area overlaps PowerPoint objects, their controls are not available anymore. Therefore, if you’re using this technique for a video, you should either set the video to play automatically or draw the shape only over a part of it. By default, PowerPoint applies different colors to new and followed hyperlinks based on the chosen presentation theme. To learn how to change the predefined color, read the following guidelines. Go to the DESIGN tab on the PowerPoint ribbon. In the Variants group, open the dropdown menu as demonstrated in the picture below. Go to Colors, and under the schemes choose Customize Colors. In the open window, change the colors of new and followed hyperlinks, then click Save. Note that if you apply another theme to your presentation, hyperlink colors will be modified too. In order to prevent yourself from having to customize them again, choose the final design for your presentation first. Follow these guidelines to create helpful tooltips that will appear every time a mouse is pointed over a relevant object on the slide. In the Edit/Insert Hyperlink window, click the ScreenTip button. In the open window, type in the text for a screentip, then click OK.
Here’s what a screentip will look like on the slide. Non-linear navigation is a big plus for complex presentations, as it enables viewers to jump to other slides at any time based on what information is most relevant in a certain situation. One way to set up non-linear navigation is to create a table of contents with internal links leading to different chapters within your presentation. To do that, you’ll need to create a table of contents first, and then add hyperlink to other slides for each topic manually. You can also set up non-linear navigation by inserting two buttons on each slide and hyperlink them to the Next Slide or Previous Slide accordingly. On the last slide you can create a button called “View Again” and hyperlink it to the First Slide, so that the presentation can be easily launched from the beginning. You can learn more about navigating your PowerPoint with Action Buttons in this article. All presentations created or converted with iSpring Converter Pro get a customizable outline and thus become non-linear and more interactive. This PowerPoint add-in also allows users to adjust the nesting level of slides and set up branching navigation, which means that the order of subsequent slides depends on whether the previous material has been understood or not. Here are a few tricks that helped us go beyond PowerPoint and enhance the original presentation in a number of ways. Open your presentation and choose iSpring Converter Pro on the PowerPoint ribbon, then click Web Object. In the open window, paste in the URL of the web page you wish to add, then click Preview. Under Size, choose whether you want the web page to be displayed in Custom size or Full Slide. We’ll use the first to combine a web page with other information within one slide. With iSpring Converter Pro, you can display web objects even without an Internet connection. To do that, first download web objects to your computer. In the Insert Web Object window, open the drop-down menu in the upper-left corner and choose Local Path. Click Browse and locate the relevant file on your computer. Then press Open > OK. Note that if the presentation you plan to publish online contains hyperlinked SmartArt object(s) or stylized text, you should create a transparent hyperlink area. To learn more, read this article on troubleshooting hyperlinks. These guidelines will help you convert a PowerPoint presentation to online mobile-ready format. 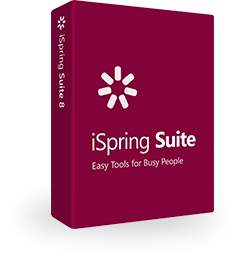 Open your presentation and choose iSpring Converter Pro on the PowerPoint ribbon, then click Publish. In the Publish Presentation window, specify the Presentation title and a Local folder. As you can see, there are different Output Options available, including HTML5, Flash, EXE, and even video. We recommend using Combined (HTML5 + Flash) format for web presentations. With iSpring Converter Pro, you can configure the presentation player before publishing. To do that, click Customize as demonstrated in the picture below. As you can see from the open window, the Universal Player is fully customizable. You can configure its Layout, Bars, Text Labels, select one of the built-in Templates and Color Schemes, or apply custom Colors. Once, you’ve customized the player and set up other publishing options, click Publish. After the process is complete, the Preview window will open, allowing you to see how your presentation will be displayed on different devices. When adding links to PowerPoint, it’s important to be aware of some pitfalls that may affect the final playback. We hope this detailed guide will meet your challenges and help you make the most of hyperlinks. The demo presentation in this article was created and published online with the help of iSpring Converter Pro, an advanced PowerPoint add-in. Do you have any questions or suggestions regarding this article? Feel free to leave them in the comments below!